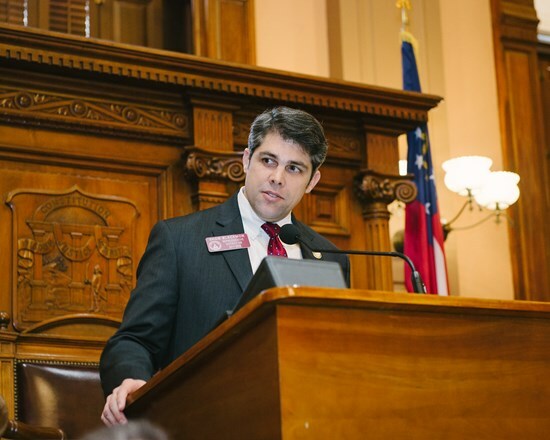 During his time in office, Shaw has made a commitment to focus on sponsoring meaningful legislation for the betterment of Georgia and her citizens. In the House, Rep. Blackmon continues to champion positive reform efforts in areas including tax reform, Agriculture, healthcare, public safety and military / veterans’ affairs. Fueled by his passion for simple, smart and effective government, Shaw works to challenge the status quo, ensuring he listens to citizen concerns, before taking action. A BILL to be entitled an Act to amend Chapter 8 of Title 48 of the Official Code of Georgia Annotated, relating to sales and use taxes, so as to change certain definitions regarding such taxes; to provide an effective date; to repeal conflicting laws; and for other purposes. A BILL to be entitled an Act to amend Article 7 of Chapter 3 of Title 47 of the Official Code of Georgia Annotated, relating to retirement allowances, disability benefits, and spouses' benefits, so as to require certain public employers to make employer and employee contributions to the Teachers Retirement System of Georgia for beneficiaries employed by such certain public employers; to permit beneficiaries to return to service full-time as teachers without affecting their benefits; to provide for related matters; to provide conditions for an effective date and automatic repeal; to repeal conflicting laws; and for other purposes. A BILL to be entitled an Act to amend Title 40 of the Official Code of Georgia Annotated, relating to motor vehicles and traffic, so as to provide for and regulate peer-to-peer vehicle sharing; to provide for definitions; to provide requirements for a peer-to-peer vehicle-sharing program; to establish safety recall and insurance requirements for such program; to prohibit the promulgation and enforcement of certain regulations by local governments as related to such program; to provide for a short title; to provide for related matters; to provide for an effective date; to repeal conflicting laws; and for other purposes. A BILL to be entitled an Act to amend Chapter 5C of Title 48 of the Official Code of Georgia Annotated, relating to alternative ad valorem taxes on motor vehicles, so as to lower the tax rate imposed; to revise a definition; to revise the date range for antique motor vehicles; to provide for related matters; to repeal conflicting laws; and for other purposes. A BILL to be entitled an Act to amend Article 1 of Chapter 13 of Title 48 of the O.C.G.A., relating to general provisions regarding specific, business, and occupation taxes, so as to eliminate gross receipts as a criterion for classifying businesses and practitioners for purposes of calculating the occupation tax levied by local governments; to remove inapplicable references; to require that the proceeds of local government regulatory fees be used to pay for regulatory activity and not general operations; to remove provisions authorizing calculation of regulatory fees for new construction, renovation, and other construction projects; to remove provisions authorizing alternative occupation tax rates for practitioners of certain professions and occupations; to provide for related matters; to repeal conflicting laws; and for other purposes. A BILL to be entitled an Act to amend Article 2 of Chapter 7 of Title 48 of the Official Code of Georgia Annotated, relating to imposition, rate, and computation of income taxes and exemptions, so as to exempt certain military retirement income; to provide for related matters; to provide for an effective date and applicability; to repeal conflicting laws; and for other purposes. A BILL to be entitled an Act to amend Article 1 of Chapter 24 of Title 33 of the Official Code of Georgia Annotated, relating to general insurance provisions, so as to provide for the compensation of health insurance agents in certain situations; to provide for definitions; to provide for exceptions; to provide a short title; to provide for applicability; to provide for related matters; to repeal conflicting laws; and for other purposes. A BILL to be entitled an Act to amend Part 7 of Article 7 of Chapter 3 of Title 20 of the Official Code of Georgia Annotated, relating to HOPE scholarships and grants, so as to provide that members of the Georgia National Guard and reservists meet residency requirements; to provide for related matters; to repeal conflicting laws; and for other purposes. A BILL to be entitled an Act to amend Chapter 5C of Title 48 of the Official Code of Georgia Annotated, relating to alternative ad valorem tax on motor vehicles, so as to change the manner of distribution of the proceeds of such tax; to provide for related matters; to provide an effective date and for applicability; to repeal conflicting laws; and for other purposes. A BILL to be entitled an Act to amend Chapter 7 of Title 50 of the Official Code of Georgia Annotated, relating to the Department of Economic Development, so as to create a program for making grants to certain organizations supporting military communities; to provide for legislative findings; to provide for related matters; to repeal conflicting laws; and for other purposes. A BILL to be entitled an Act to amend Article 2 of Chapter 7 of Title 48 of the Official Code of Georgia Annotated, relating to the imposition, rate, computation, and exemptions from state income tax, so as to clarify an exemption for retirement income is applicable to income received by a taxpayer as a retirement benefit from non civilian service in the armed forces of the United States or the reserve components thereof; to provide an exemption for certain military retirement income for surviving family members; to provide for related matters; to provide for an effective date and applicability; to repeal conflicting laws; and for other purposes. A BILL to be entitled an Act to amend Article 1 of Chapter 13 of Title 48 of the Official Code of Georgia Annotated, relating to general provisions regarding specific, business, and other occupation taxes, so as to change certain provisions regarding the ability to elect the amount of any occupation tax levied by the local government; to provide for related matters; to repeal conflicting laws; and for other purposes. A BILL to be entitled an Act to amend Chapter 24 of Title 33 of the Official Code of Georgia Annotated, relating to insurance general provisions, so as to provide that carriers that sell certain health insurance plans in this state through an agent shall compensate such agent a minimum of 5 percent of the collected premiums; to provide for exceptions; to provide for definitions; to provide for related matters; to provide for an effective date; to repeal conflicting laws; and for other purposes. A BILL to be entitled an Act to amend Chapter 50 of Title 33 of the Official Code of Georgia Annotated, relating to multiple employer self-insured health plans, so as to exempt multiple employer self-insured health plans from premium taxes; to provide for related matters; to repeal conflicting laws; and for other purposes. A BILL to be entitled an Act to repeal an Act creating the Houston County Commission on Children and Youth, approved April 14, 1997 (Ga. L.1997, p. 4177); to provide for the assets and liabilities thereof; to repeal conflicting laws; and for other purposes. A BILL to be entitled an Act to amend an Act authorizing the governing authority of the City of Warner Robins to levy an excise tax pursuant to subsection (b) of Code Section 48-13-51 of the O.C.G.A., approved May 11, 2009 (Ga. L. 2009, p. 3981), as amended, particularly by an Act approved May 12, 2015 (Ga. L. 2015, p. 4161), so as to identify the projects or tourism product development purposes and specify the allocation of proceeds of the excise tax; to provide for related matters; to repeal conflicting laws; and for other purposes.